The first thing I always do when I pick up a new book is flip it over and read the back cover. 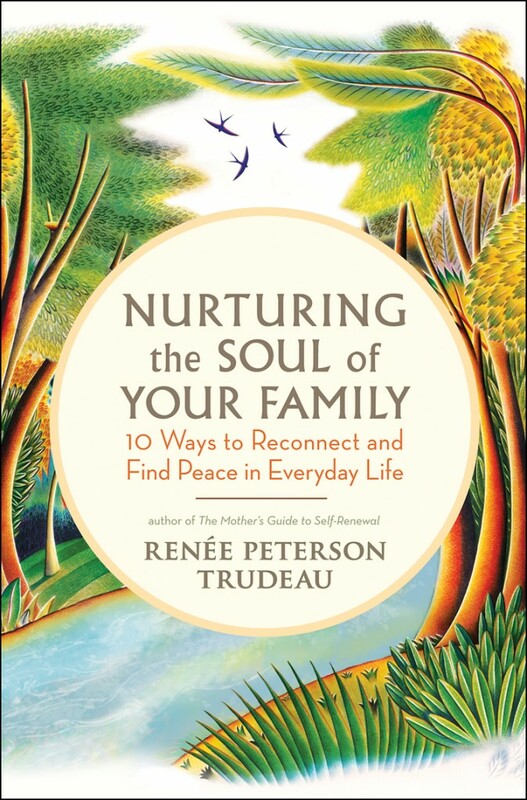 My latest was Renee Trudeau’s new book, Nurturing the Soul of Your Family – 10 Ways to Reconnect and Find Peace in Everyday Life. In fact, I soon discovered that Renee Trudeau’s book is the guiding light I’ve been searching for since I began this wild and wonderful child-rearing journey. When I read that line, I thought maybe Renee had a hidden camera in my kitchen (or perhaps my car). But then I thought of all the recent conversations I’ve had with so many friends, all with children of various ages, asking exactly those same questions. Where did all the fun go? And more importantly, How do we get it back? and Is it even possible? Well, here’s the good news. I can honestly say that after reading (devouring) this book, I know it is possible. At other times in the book, Renee is firm and clear, and offers much needed directives. When she talked about self-care, it really hit home for me. “Regardless of what we tell our children, we teach them about self-worth and how to honor oneself through our actions, not our words.” Ok, so if my kids see me taking my daily walks, excusing myself for much needed naps, scheduling Reiki and massage appointments, as well as date nights with my hubby, they’ll learn to do the same? Sounds like a win-win to me. What about you? Here’s the other thing. I’m a bargain shopper who loves a great deal. This book is a great deal. I’m not talking about the price, I’m talking about what’s between the front and back covers. Seriously, there are like hundreds and hundreds, if not thousands of dollars worth of therapy and life-coaching wisdom packed into this book. As I read, I kept thinking, Holy Smokes, I’m getting all of this out of just one book! By far, the coolest result so far from reading Nurturing the Soul of Your Family is the wonderful night we had as a family, meeting and discussing what we could do to bring more fun back into our lives. We’ve tried family meetings before, but usually someone stomps out of the living room before we can make any progress. This time, however, inspired by the book, I called it a “Team Meeting” and declared we’d do it once a month and that we had to eat pancakes for dinner on Team Meeting Nights. The kids loved it! We made a list of all the things the kids thought we could do together to bring more joy back into our lives – playing tag, going bowling, pancakes for dinner(!). The meeting also took on a more serious tone and became an opportunity for all of us (especially the kids) to share their worries and concerns and grievances and feel like they were really being heard. During the meeting, we all agreed that the technology in our home (3 laptops, 1 iPad, 1 iPhone, 1 blackberry, 2 Kindle Fires and 2 iPods) had become an issue. So I proposed a one day a week, device-free day. Sunday seemed to make the most sense. The kids were pretty reluctant, but surprisingly my husband readily agreed, even pushing the kids. “Come on guys, we can do anything for one day.” When I cleared my throat and told him I meant all Sundays, his face fell for a moment before he regained his composure and tried to display his enthusiasm. I’ll keep you posted on how it goes! Either way, Renee Trudeau’s book has got me thinking and questioning and striving for a more conscious, peaceful and joyous family life and I could not be more grateful. And I know it will do the same for you. 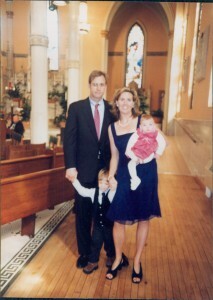 Eleven years ago when the fun was just beginning.